Provide comfort for the family of Frances O'Brien-Flaherty with a meaningful gesture of sympathy. 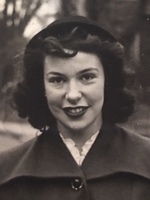 Born January 25, 1926, daughter of the late Francis Quinn and Irma Ashton Quinn, sister of the late Walter (Rita) and Paul (Jean), sister –in- law to Betty and Reg Jackson, both deceased, the late Monsignor William O’Brien, and missed by Peggy (O’Brien) and Jack Whyte. Our sweet mother Fran peacefully joined our Lord in Heaven April 8th, 2019. But a whisper in the wind when she left us, we know that she is now with her husbands Fred O’Brien (1925-1975) and Peter Flaherty (1925-2007) and daughter Margaret Cook (1957-2009), and many friends and relatives who will be overjoyed to once again delight in her sense of humor, quick wit and uncanny ability to create fun wherever she is. Our family story is one of heartbreak, survival love and joy. Frances Ann Quinn was married to Edward Fredrick O’Brien on May 21st, 1949. Together they had 6 Children; Jan Meschino (Glen), Michael O’Brien, Patti Leonard (Bill), Kathy Hayes (Scott), Margy Cook deceased (Dave) and Bill O’Brien. Fred died at the age of 50 after 25 years of marriage leaving our mother a young widow. Two years later our father’s best friend Peter Flaherty suddenly lost his wife Elin in 1977 leaving Peter with 7 children. Fran and Pete married in December 1983 again reaching the 25-year milestone until Pete’s death in 2007. Frances also leaves behind 7 stepchildren; Shelagh Flaherty (Tony Gismondi), John Flaherty (Penny Sheridan), Brenda Flaherty (Brent Wood), Marnie Flaherty (Paul Benedetti), Sandy Flaherty (Jess Hovanes), Patti Flaherty and Barbara Flaherty (Tyson Haedrich). Also left are grandchildren Jessica Meschino (Paul Cooper), Kieran Bennett (Chris), Lauran Meschino (Stephanie Lockert), Lucas Meschino, Jennifer Roberts (Adam), Quinn O’Brien, Chelsea Johnson (Bob Meilleur), Casey Leonard, Mary Sullivan (Robins Robbins), Greg Hayes (Taylre Duarte), Devon Hayes, Patrick Cook (Lauren), Emily Cook (Shan Lebrie), Bryan Cook (Krystin), Michael Gismondi, Elin Gismondi, Philip Flaherty (Christine), Peter Flaherty, Marina Flaherty, Brittney Hatcher, Katherine Wood, Rebecca Wood, Emma Wood, James Benedetti, Matthew Benedetti, Ella Benedetti, Owen Haedrich, Graham Haedrich. Great Grandchildren Sam Robbins, Nicola Robbins, Paisley Roberts. Also missed by many nieces and nephews. Together the O’Brien and Flaherty family have shared so much and remain eternally grateful that we have such a large family who share laughs and sorrow and all the ups and downs in life. A special thank-you to Salli Wilde, and the wonderful staff at Idlewyld Manor who took such wonderful care of our mother, especially our earth angels Josephine, Anna, Erica, Petra, Laura and Jeanna. Visitation at the P.X. DERMODY FUNERAL HOME, 7 East Ave S., on Thursday, April 11, from 2 to 4 and 7 to 9 p.m. with Parish Prayers at 2 p.m. A Funeral Mass will be offered at St. Joseph catholic Church, Herkimer St at Locke St. S., on Friday, April 12 at 10 a.m. Interment, Holy Sepulchre Cemetery. Memorial Donations to the Charity of your choice would be appreciated. www.dermodys.com. 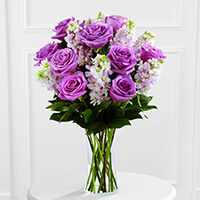 To send flowers in memory of Frances Ann "Fran" O'Brien-Flaherty (Quinn), please visit our Heartfelt Sympathies Store. Parish Prayers at 2 p.m.
Claude & Bettee Ann Labrie and Anne Bell have sent flowers to the family of Frances Ann "Fran" O'Brien-Flaherty (Quinn). My condolences on your Mom's passing. Fran was one of a kind. I'm sorry I'm unable to attend, but I will be thinking of all of you. Love Beane. Sincere condolences from the Paxton family. Heartfelt Sympathies Store purchased flowers for the family of Frances O'Brien-Flaherty. Claude & Bettee Ann Labrie purchased the The FTD All Things Bright Bouquet for the family of Frances O'Brien-Flaherty.